 2017-11-05 FYIcenter.com: @sujay, you can download and install the latest JDK package. 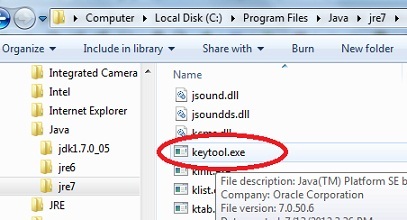 The keytool.exe will in included in the .\bin folder.  2017-04-28 FYIcenter.com: @volo, "keytool" is backward compatible. You can safely use any newer version of "keytool" to manage older keystore files.  2017-06-17 FYIcenter.com: @peace, may be this article Why can't I upload or download media files? can help you.  2016-08-01 Tom: Meaningful comment.  2014-05-31 FYIcenter.com: @JBL, you are right. the Mozilla FTP server seems to have a problem. May be they will fix it later.  2014-05-29 JBL: At this time the ftp directories indicated for the above downloads are apparently empty.  2014-11-24 Jeff: How I can import existing .cer certificate to firefox database using command line? Tool for cert8.db and key3.db Files - Mozilla "certutil"
 2018-10-19 sailing: @fyicenter, thanks very much.  2018-10-18 FYIcenter.com: @sailing and others, replacement suggestion is added.  2018-10-18 sailing: could you please upload newer CA which do NOT expired?  2017-07-29 FYIcenter.com: @Walter, Tutorial updated now. Thanks for your comment!  2017-07-28 Walter Hallows: Check accuracy. Step 5 is listed twice and "Portecle" is spelled "Fortecle" twice, in what should be step 6.  2017-01-24 Rakhee Kulkarni: cool works!